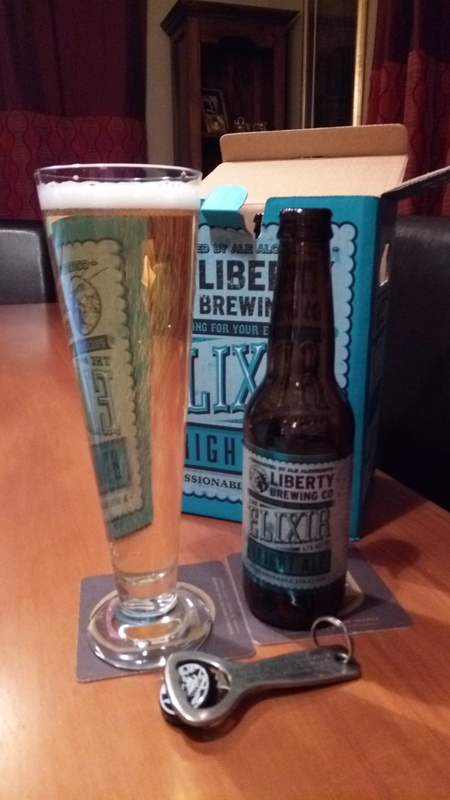 Six of the best Liberty Elixir Bright Ale’s in a carry out box. A Gift from #1 son. Well done lad. In 330ml bottles this is beer of a 4.7% ABV, with the 210 calories a serve size, each bottle 1.2 standard drink worth. sending peachy tropical signals to the grey matter, which highly commend it; and yet these properties are in no way indicative of taking medicine. Every mouthful of this delicious beverage is prepared under the PERSONAL SUPERVISION OF MR JOSEPH WOOD ESQUIRE THE FIRST. It is comprised of the finest selected domestic malts and hand picked Amarillo and Nelson Sauvin hops. I did a BBQ tonight, it is a few days into the spring season, and close approaching the equinox. Summer cometh. After all that labour what better way to carry on than an Elixir. Highly hopped up aroma on opening, green grass type of thing, surgery too. The palest beer I had in a while this pours with a small and persistent head, can’t get over how pale it is to be honest. This is full aroma and has some interesting tastes but this suffers from a lack of push in the body, so although it is flavoursome and enjoyable it isn’t beer that has taste that lingers in the mouth, it is there one minute and gone the next. This isn’t like a domestic malt beer though, this does have some of that hop action going on, it has a foot in both camps as it were. I’ll probably the half-dozen and thank boy-child when I see him. The pdubyah-o-meter rates this as 7 of its things from the thing. It’s just not memorable. IT tries hard with that hop hint, and has a nose like it means the business. I felt that this was more a lager type than an Ipa type of beer, which is reflected in the way that this beer might be tied to styles on the various places. Liked the hop things, aroma, bitter notes, but it didn’t have enough in the body.. then again as a lager this had odd hop notes and crispness that made it enjoyable. Odd alright. Would I share with a friend on a porch and set the world to rights? Sure a six box wouldn’t be embarrassing there is enough of the hop bitterness and aromatics on the tongue and nose to keep you in the game. Not the best session beer though by a chalk but not one to be passed over because it’s got appeal. It’s a bit of good really. 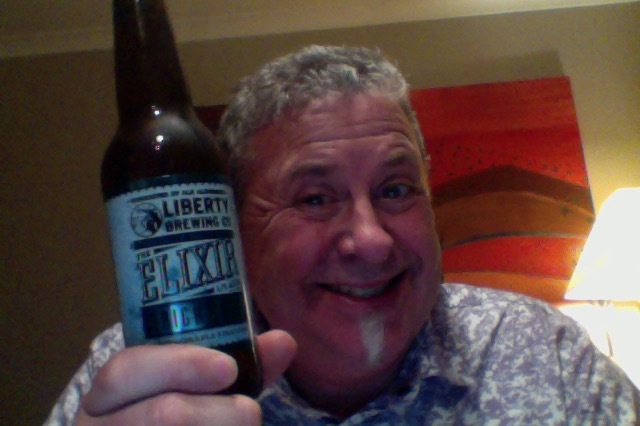 This entry was posted on September 9, 2016 by Philip Walter in Beer, Beer of New Zealand, Beer Review, Craft Beer, Critic, Justsaying, Liberty Brewing, Session IPA and tagged craft beer, Elixir Bright Ale, Liberty Brewing, Liberty Elixir Bright Ale.